The Assault on Mt. Mitchell is Sold Out. Register Today for the Assault on Marion. The Assault on Mt Mitchell is SOLD OUT for 2019. We invite you to ride Marion the shorter, 74-mile part of the Assaults route that ends at Rest Stop #5. We are currently offering a rider special for Marion Riders — ALL 2019 MARION registrants will have the opportunity to register early, before general registration opens, for the 2020 Mt Mtichell ride. Registration for Marion is currently open. Please click here to register today and secure your spot to register early for Mt. Mitchell in 2020. The Assault on Mt. 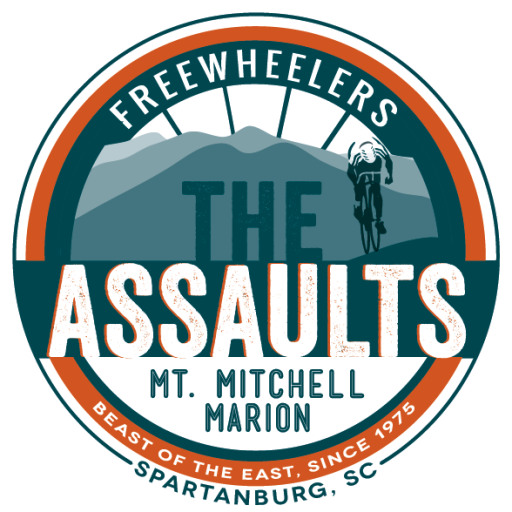 Mitchell is a 102.7-mile self-paced ride from Spartanburg Memorial Auditorium in downtown Spartanburg, South Carolina, along the Blue Ridge Parkway, to the summit at Mt. 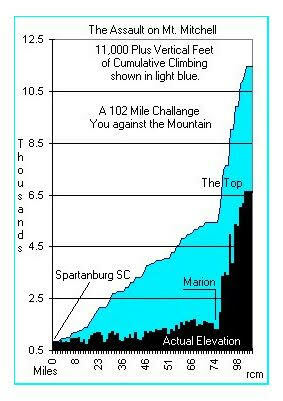 Mitchell State Park in North Carolina—a total vertical ascent of more than 10,000 feet. With 10 rest stops along the way, you will be able to refill, refuel, and make mechanical adjustments as needed. The 44th Assaults on Mt. Mitchell presented by Prisma Health will be on Monday, May 20, 2019. For Safety and Training information click here. Transfers: If those signed up are unable to participate, you may transfer your registration to another rider. To transfer registration, click ‘Edit’ under your entry and choose ‘Transfer Registration.’ Here, you will be prompted to enter in the email address of the person receiving the transfer and click the button again. The person receiving the transfer will need to go through the checkout process to receive the transferred registration. Head over to the Assault’s Facebook event page to find riders who are looking for a transfer. Note, it is up to the individual parties to set and collect any amount outside the $30 transfer fee paid through Bike Reg. The Assault on Mt. Mitchell is a point A to point B ride, not a loop, and no personal vehicles are allowed on the Parkway or Summit. Therefore, the ride holds a difficult degree of logistical planning to get riders off of Mt. Mitchell, safely and back to Marion, NC. The Assault on Mt. Mitchell registration includes transportation from the finish line in Mt. Mitchell State Park to Tom Johnson Campground (Marion, NC). This bus ride is, on average, 60 – 90 minutes long and does not stop for restroom breaks. Absolutely no personal vehicles are allowed on Mt. Mitchell – all riders MUST be transported off the mountain via bus. This a policy set forth by the Blue Ridge Parkway and Mt. Mitchell State Park that we must adhere to. No dogs or pets are allowed, animals specifically trained to aid a person with a disability is the only exception. Bikes will be put on a separate truck and transported to the Tom Johnson Campground. No exceptions. Option 2 ($75): Direct return bus for those who wish to leave Mt. Mitchell and be transported directly to Spartanburg Memorial Auditorium. Buses will leave promptly at 2:00 p.m. and 4:00 p.m. from Mt. Mitchell. If registering for this option, you must finish your ride within 7 or 8.5 hours. Box lunch will be provided on the bus, and the bus will make a stop for a restroom break. Space is limited for this three-hour bus ride. No refunds will be issued if you are unable to board the 4:00 p.m. bus. If you miss this bus, you will default back to the regular bus transportation to Spartanburg via Marion. Your bike will be transported via truck to Spartanburg. You may have to wait on your bike in Spartanburg depending on where it is in the loading and truck queue departure line. Bikes cannot be transported on the bus. Option 3 ($30): Monday regular bus – After being bused from Mitchell to the Tom Johnson Campground and enjoy lunch you will board a bus to the Spartanburg Memorial Auditorium. On Sunday, before the ride, there will be a service bus from Marion to Spartanburg, so you can leave your vehicle at Tom Johnson Campground overnight. A bus will depart the campground at 4 p.m. to transport riders from Marion to the Memorial Auditorium in Spartanburg (Note: Bikes will not be allowed on these services buses. You will have to make separate arrangements to transport your bike to Spartanburg). Purchase bus ticket during registration, then you will pay a $5 parking fee directly to Tom Johnson Campground and park in a designated area when you arrive on Sunday, May 19. Parking closes at 6 p.m. Registration for the Assault on Mt. Mitchell Open Now!